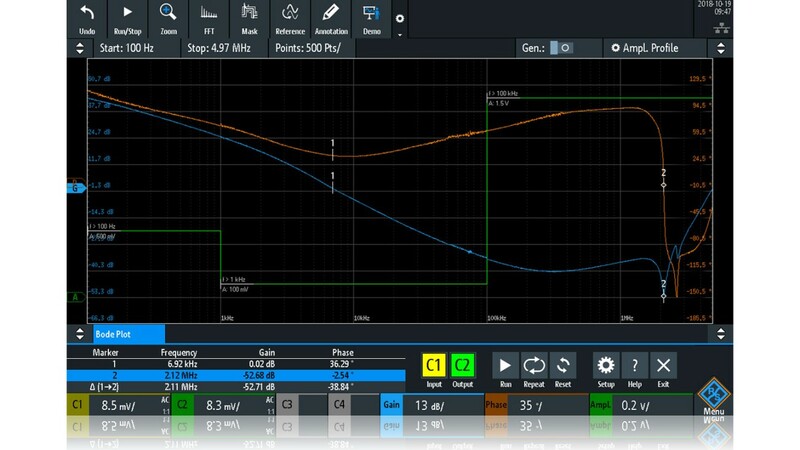 The R&S®RTx-K36 frequency response analysis (Bode plot) option lets you perform low-frequency response analysis on your oscilloscope easily and quickly. It characterizes the frequency response of a variety of electronic devices, including passive filters and amplifier circuits. For switch mode power supplies, it measures the control loop response and power supply rejection ratio. 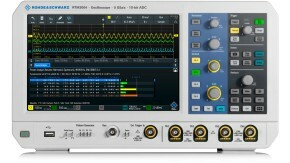 The frequency response analysis option uses the oscilloscope’s built-in waveform generator to create stimulus signals ranging from 10 Hz to 25 MHz. Measuring the ratio of the stimulus signal and the output signal of the DUT at each test frequency, the oscilloscope plots gain and phase logarithmically. 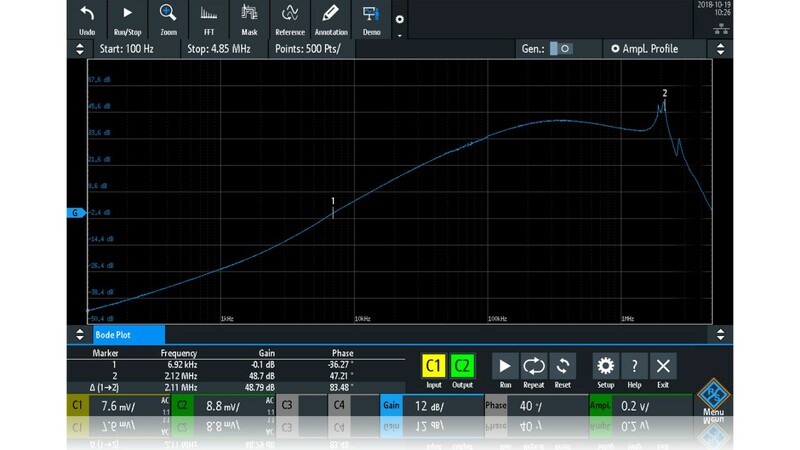 The R&S®RTx-K36 frequency response analysis (Bode plot) option allows users to profile the amplitude output level of the generator. This helps to suppress the noise behavior of the DUT when performing a control loop response or power supply rejection ratio and to improve signal-to-noise ratio (SNR). It is possible to define up to 16 steps. You can choose the points per decade to set up and modify the resolution of your plot. The oscilloscope supports up to 500 points per decade. Markers can be dragged to the desired position, directly on the plotted trace. A legend displays the corresponding coordinates of the markers. To determine the crossover frequency, set one marker to 0 dB and the second marker to –180° phase shift. Now you can easily determine the phase and gain margin. Furthermore, you can view the results in a table. The table of measurement results details information about each measured point, consisting of frequency, gain and phase shift. In case you use cursors, for ease of use, the associated row of the result table is highlighted. For reporting, screenshots, table results or both can be quickly saved to a USB device. 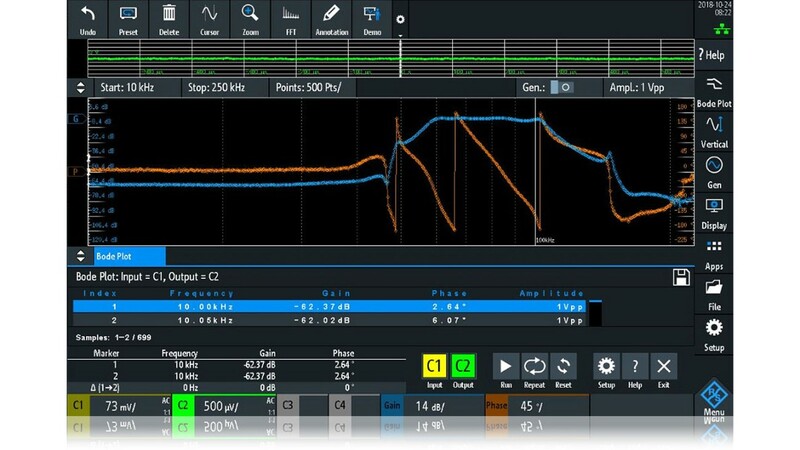 Accurate control loop response or power supply rejection ratio characterization highly depends on choosing the right probes, since peak-to-peak amplitudes of both Vin and Vout can be very low at some test frequencies. These values would be buried in the oscilloscope’s noise floor or in the switching noise of the DUT itself. We recommend the low-noise R&S®RT-ZP1X 38 MHz bandwidth 1:1 passive probes. These reduce measurement noise and provide the best SNR.